Tribes Overall: "This was a family treat for our 60th birthdays, with kids and their partners, and we all had a fantastic time. A really memorable celebration which will stay with us." Tribes Service: "All incredibly smooth"
Guides: "Transport was smooth, and drivers both friendly and informative - all went like clockwork. Guiided tours were more of a mixed bag (see below)"
Social & Environmental Responsibility: "As you say, hard to know. But we speak Spanish and spoke to lots of people involved in the tourist trade, and they all seemed very positive. Obviously, the big gap was that we didn't speak to any local people not involved in the tourist sector." A great first location, with wonderful birds and frogs. The vibe was genuine eco, which went down very well with all of us. The only fly in the soup was the road noise - having a major highway running right through the lodge may make access easier, but it sllightly harshes the general mellow. Mixed reviews from our party. Some people liked the luxury, especially the wet bar! Others (i.e. me) found it all too Fat American - the golf buggies and the Stepford Wives hut layout etc. The food was OK, but overpriced, so we spent most of our evenings escaping to the nearby town (La Fortuna), which we really liked. Great way to end the holiday, the beach was much nicer than anticipated, amazingly free of both rubbish and tourist hustle. Given that Tamarindo is Costa Rica's number one tourist destination, it all felt very easy and friendly. The atmosphere was friendly and relaxed, and the howler monkeys and iguanas feeding from the hand were amazing! "We thought the balance was just right (rainforest, volcano, beach); the logistics were a well oiled machine, and the accompaniment was not too intrusive. 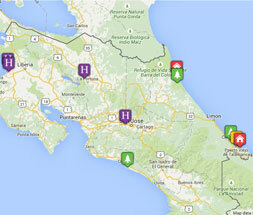 Costa Rica surpassed expectations, - incredibly tourist friendly, hassle free. safe and of course, beautiful. "